The Wilkins Ice Shelf, on the western side of the Antarctic Peninsula, experienced multiple disintegration events in 2008. By the beginning of 2009, a narrow ice bridge was all that remained to connect the ice shelf to ice fragments fringing nearby Charcot Island. That bridge gave way in early April 2009. 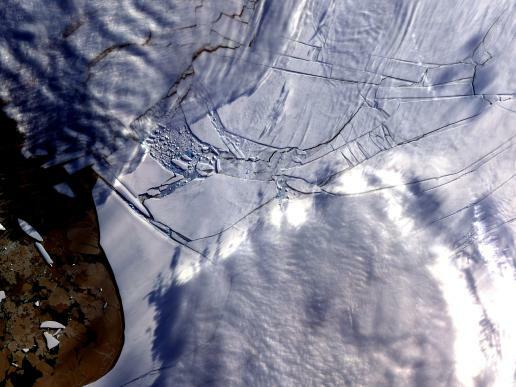 Days after the ice bridge rupture, on April 12, 2009, the Advanced Spaceborne Thermal Emission and Reflection Radiometer (ASTER) on NASA's Terra satellite took this image of the southern base of the ice bridge, where it connected with the remnant ice shelf. Although the ice bridge has played a role in stabilizing the ice fragments in the region, its rupture doesn't guarantee the ice will immediately move away. With its 14 spectral bands from the visible to the thermal infrared wavelength region and its high spatial resolution of about 50 to 300 feet, ASTER images Earth to map and monitor the changing surface of our planet. ASTER is one of five Earth-observing instruments launched Dec. 18, 1999, on NASA's Terra satellite. The instrument was built by Japan's Ministry of Economy, Trade and Industry. A joint U.S./Japan science team maintains the instrument and its data products.